It's All In Your Head: Danger! Danger! Danger! What's new with your subconscious? My guess is...Not Much. You see, your subconscious mind is the computer program playing in your head 24/7, and it's what's running your life at least 95% of the time. How can I say that? It's easy. When people are not present in the here and now, their subconscious takes over. When you were brushing your teeth this morning, did you consciously think of every step? What about shaving or putting on makeup? Making breakfast? Eating breakfast? Do you remember driving to work? Can you remember everything you did at your job? I'm guessing the answer is a big fat NO. The reason is likely due to stress. 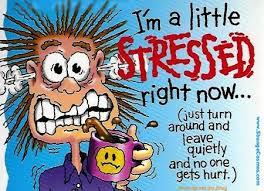 We are more stressed now than at any time in our history. And when humans are stressed, the body goes into "fight or flight" mode. Resources are redirected to areas of the body that will give us the best chance of survival. That means blood is directed away from the digestive and reproductive organs and to the heart, lungs, arms and legs. The body also allows the subconscious part of your brain to take over. Your conscious brain can process 40 bits of information per second. But your subconscious brain can process 400 million bits per second. If you are going to survive the perceived danger, there's no time to think consciously. Reflex action is needed, and that's what the subconscious is good at. The problem is that our subconscious is filled with all those messages we've heard from our earliest years..."You're not good enough", "You'll never be able to do that", "Can't you do anything right?" And we've added our own negative self-talk over the years. It doesn't matter that you're not really in danger; stress is all about "fight or flight". The body believes it's in danger, and it will do its best to survive. Unfortunately, the messages your subconscious is giving you when you're not paying attention (which is most of the time) are those negative thoughts that are rattling around in your head. Instead of stressing, try this. Practice present moment awareness everyday. Start focusing on your breath for a minute in the morning and a minute before you go to bed for the first week, then do two minutes twice a day for the second week. three minutes for the third week and so on. By the end of a month, you will be noticeably calmer. The more you practice being here now, the easier it becomes.